Do not buy ready marinated foods – they are pretty average and you can do better yourself without too much time or hassle. You can buy sheets of spare ribs, which can be left whole or cut into manageable lengths for cooking, then cut into individual ribs once they have been barbecued. Serve with potato skins and chargrilled corn on the cob, with napkins and finger bowls on hand for those sticky fingers. Put all the marinade ingredients in a large shallow dish, then mix thoroughly to combine. Add the ribs and turn them in the mixture to coat evenly. Cover and leave to marinate in a cool place for 2-4 hours, or in the fridge for up to 24 hours. 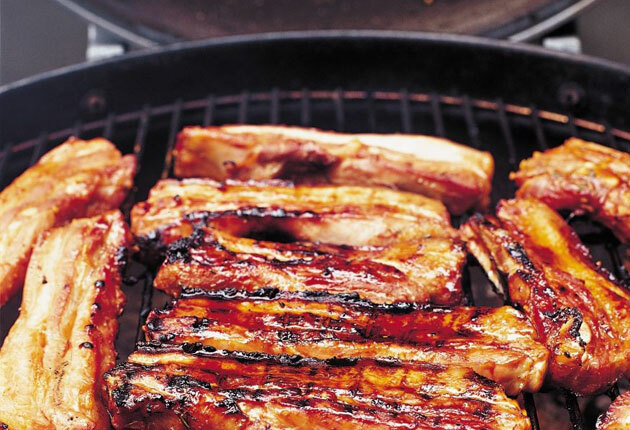 Put the ribs in a large, deep saucepan – you may have to split the sheet in half to fit. Pour over the tomato ketchup mixture and add just enough water to cover the ribs completely. Bring to a simmer, then cover and cook over a medium heat for about 1 hour until completely tender. Remove the ribs from the heat and transfer to a large, shallow, non-metallic dish. Allow the ribs to cool in the marinade, then chill until ready to put on the barbecue. They can be kept in the fridge for up to 24 hours. When ready to use the ribs, carefully scoop off the fat from the top of the mixture and discard, then allow the mixture to come back to room temperature. Drain off all the marinade and pour some into a large, wide saucepan. Cook it over medium heat, stirring occasionally, until reduced to a sticky coating consistency. Set the ribs on the barbecue grill over medium-high heat and cook for 8-10 minutes each side, occasionally basting or painting the ribs with the reduced marinade until lightly charred. Cut into single ribs to serve. Remember, marinade is a noun, marinate is a verb. This entry was posted on November 7, 2010 at 7:08 am and is filed under Food with tags garlic, ginger, honey, marinade, marinate, noun, pork, recipes, rosemary, sherry, soy sauce, spare ribs, star anise, tomato ketchup, verb. You can follow any responses to this entry through the RSS 2.0 feed. You can leave a response, or trackback from your own site.